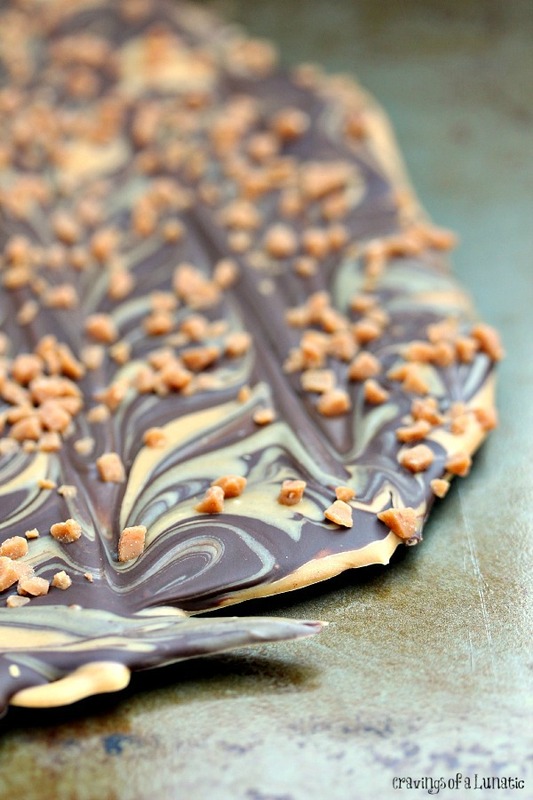 This easy to make Chocolate and Peanut Butter Bark is a real crowd pleaser. The chocolates are marbled together then topped with Skor Bits. 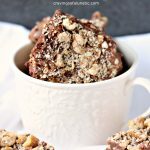 This is pure chocolate and peanut butter heaven, with little nuggets of toffee on top. 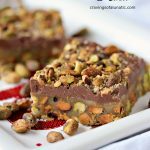 If you like the combination of peanut butter and chocolate this recipe is for you. 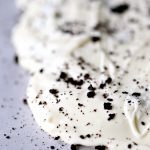 If you like easy recipes this is also for you. This one take just a few minutes to make. The downside is it only takes a few minutes to devour as well. So make a lot. Then regroup, and make some more. Trust me. You’ll thank me for that advice one day. 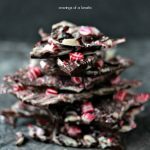 I love making chocolate bark. It goes back to my childhood. My dad loved bark, he would go cuckoo for it at Christmastime. Anyone who asked what dad wanted for Christmas was told Laura Secord Bark. My dad was hard to buy for so we all took his shopping advice and he would end up with piles and piles of bark. He would then hoard the bark so it would last all year long. 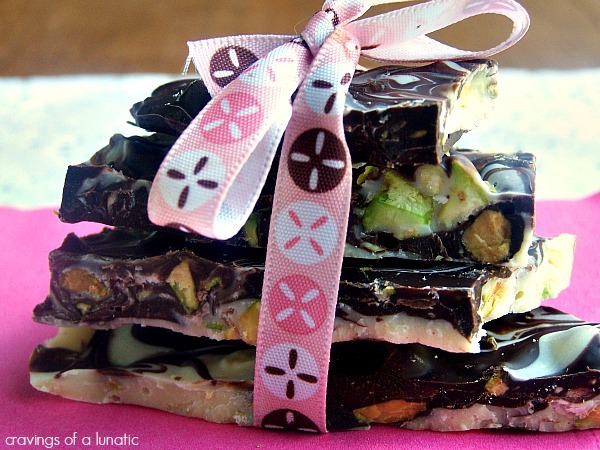 Since I was also a huge chocolate bark fan I learned the only way to pry dad away from the Laura Secord was to impress him with other homemade variations. 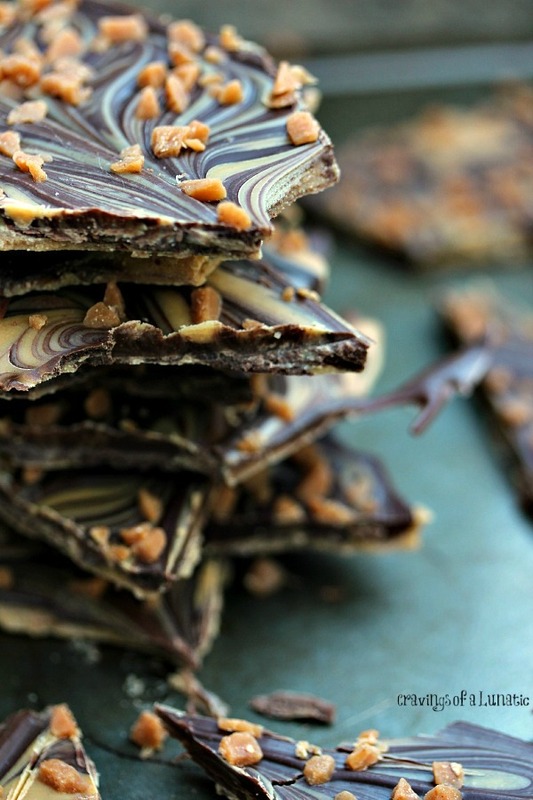 I have so many amazing memories that revolve around chocolate bark. It always put a smile on my dad’s face, and let’s just say that was not an easy thing to do. So I take great joy in the fact that my chocolate treats made my dad smile. Now every time I make them they make me smile too, and think about my dad. And his giant love of all things chocolate. So live it up a little. 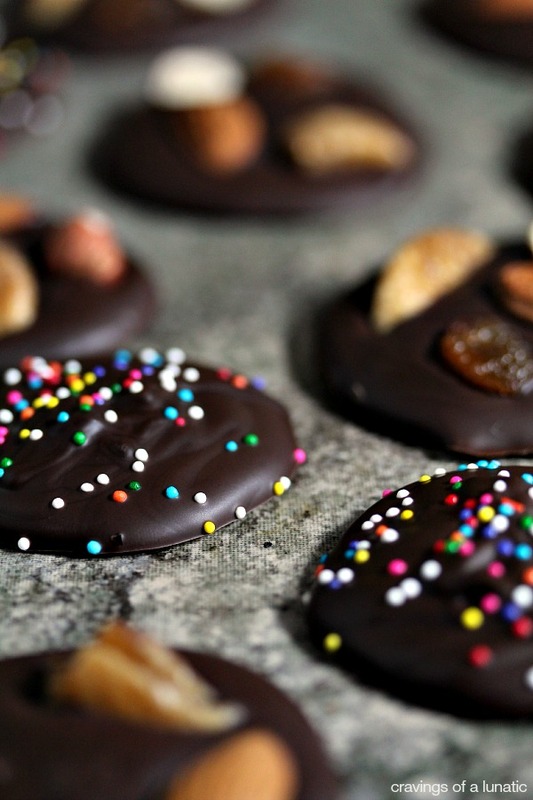 Make this on the weekend for no other reason than you want to indulge a little bit. Spoon each one alternately in lines on the pan you line with parchment paper. Just add it randomly, doesn't need to be any rhyme or reason to it. Continue until all the melted chocolate and peanut butter is on the sheet. Now take a butter knife and start to pull it through the colours to create a marble effect. I like to do mine in lines and pull straight through. I like the look of it. But design yours any way your little heart desires. 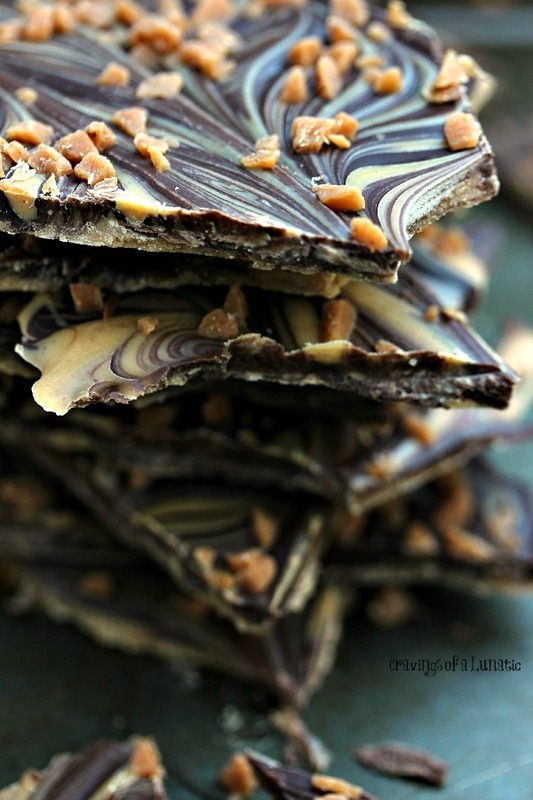 Toss the skor toffee bits on top. Hope you get a chance to try this. It’s spectacular. I love chocolate and peanut together. It’s a flavour combination classic for a reason. You can swirl this any way you like. Grab a knife and just go to town. Make patterns and enjoy the process. Then inhale the whole batch in 1.399 seconds. Thanks for letting me share some memories of my dad today. Some days he’s on my mind a lot. Especially when I bake because he loved sweets so much. I miss being able to run new recipes over to him to try. He was always a willing taste tester. I miss that. Bonding over chocolate, it was kind of our thing. I encourage you to go bond over some chocolate with someone today. You’re not just making treats, you’re making memories. That’s everything in life. You can never go wrong with the chocolate & peanut butter combo. Never. And using it in bark? Pure pleasure. Good recipe — thanks. Thanks John. It’s odd because I would not say I’m a peanut butter person, I never eat just peanut butter. My brother does, right out of the jar. But for me I only like it in baked goods. It’s weird I know. Once I bake with it I can’t stop eating it. What a sweet post, Kim! I am definitely going to try this, I think barks are so much fun to make! Thanks Sue. Some days I can’t help but think about my folks. I’m sure the fact that we bought their house does not help. Lots of memories here. Hope you love it. I adore bark. It’s so easy to make and just puts a smile on everyone’s face. 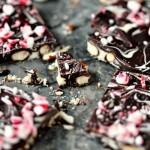 I could totally go for loads and loads of this chocolate bark for Christmas. Mind you, I will have just had a baby, so I would probably have to share with those around me. Looks awesome! I would hide it so no one can see it. It’s just how I roll. Ha! Hope you’re feeling great. I had weird pregnancies. One I got chicken pox during, and one I had to go on bed-rest. With a 5 year old at home. Like that’ll happen right. Lol! I would do a happy dance if I got some of this bark for a gift. I love food gifts. And I LOVE chocolate and peanut butter. aww. I can’t imagine anyone NOT liking this bark! I love the gorgeous swirl and putting toffee on top is just the extra piece de resistance! *muah*! Hey Regan. Great question. Unfortunately using just peanut butter wouldn’t work. Bark is essentially chocolate mixed with other things. My suggestion would be to find white chocolate chips and mix some peanut butter into it. I’d melt about 1 and 1/4 cup white chocolate (or even milk chocolate, it just won’t look quite the same) then mix in 1/4 cup peanut butter. Stir until it’s smooth, then proceed. I’ve not tried doing it myself, but I think it would work perfectly. 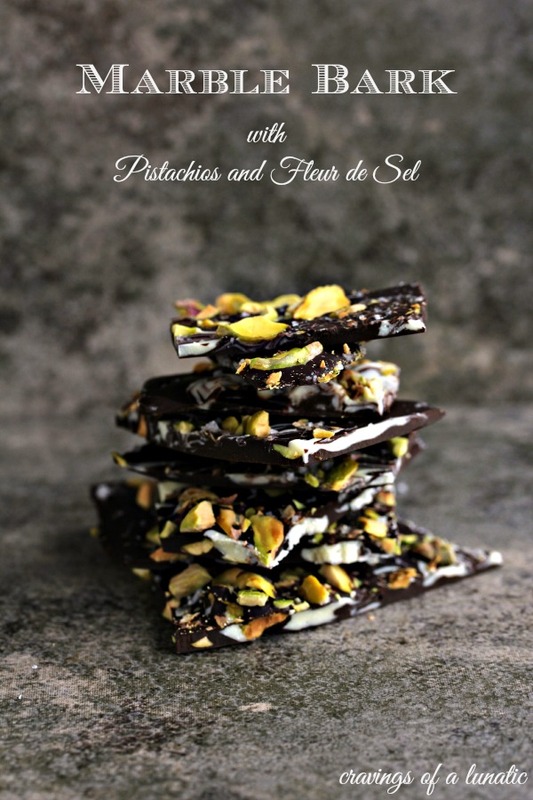 Have you tried making this bark with a semi-sweet or dark chocolate? 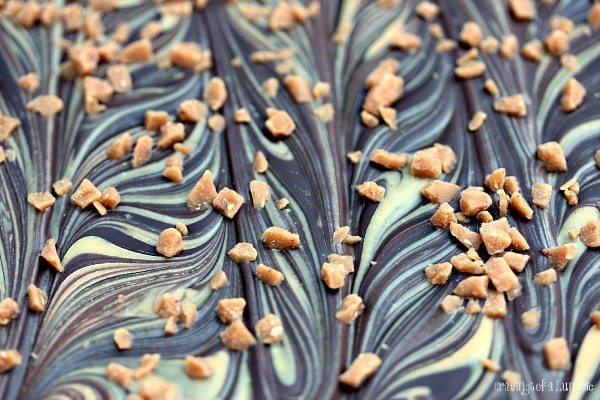 Sorry – I’m drooling just thinking about this bark. Semi sweet is awesome, so is dark. 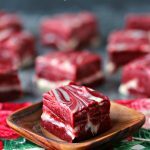 Could I substitute butter for the shortening in this recipe ? Is the shortening necessary? I don’t usually have that in pantry. You can totally use butter for this. Once the bark is set & broken up, can it be stored at room temperature? Hi Jane. It can be stored at room temperature but it’s better if you can store it in the fridge. I find it keeps better that way. Hope that helps. Happy holidays.